The museum of Vat Phou shows this picture by Pierre Pichard. Vat Phou has been founded by the Cham, according to the historians and was later one of the first temples of the Khmers outside Cambodia. The oldest ruins date from the fifth and sixth century. Vat Phou nestles at the base of Mount Phou Pasak, that got the name Lingaparvata, because on top a 60 metres high monolith reaches into the sky. This natural outcropping has led the people to consider it a sacred place long ago. It resembles to linga of Shiva, the god of the Hindu. To some visitors it resembles also a female breast (see picture by Diane, taken on Don Daeng). "Parvata" means "mountain," so "Lingaparvata" is literally "Linga Mountain." It is the same word-root as "Parvati" the name of Shiva's consort, a mountain-goddess, notes art-and-archaeology.com. Willard Van De Bogart tells the story of Lingaparvata, the story was also published with a lot of book references. Read also the official site description by the Museum of Vat Phu. Picture marhas First yuu see one of the barays - a Khmer word for a lake. The barays symbolize the ozeans around the holy mountain Meru. 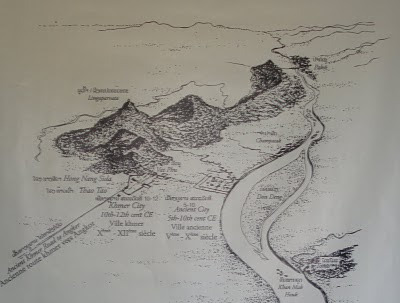 The way for the processions towards Vat Phou with Lingaparvata (right). Ho Thao, the palace on the south side of the procession way, a room for men. A Dvarapala, a guardian on the second terrace. Way up to the stairs of the third terrace. Look down: the processions way, the palaces and the barays. Every year for Makha Bousa (fullmoon day of the third lunar month) thousands of people celebrate the Vat Phou Festival. In 2011 this will be from 25 to 30 january. Thousands of oil lamps will light up the temple grounds (read more). Daovone Guesthouse: From 5 USD. 6km south from the ferry crossing, closest guesthouse to Vat Phou. Dok Champa Guest House: From 4 USD. Inthira Hotel: From 50 USD. Good reviews on tripadvisor.com, some guests describe problems with communication. Pimphone Guesthouse: From 4 USD. 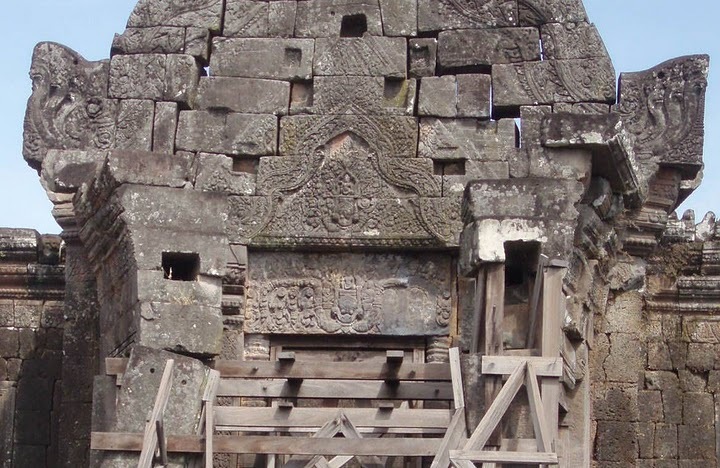 Closest to Vat Phou. Saythong Guesthouse: "Fine restaurant", notes travelfish.org, but "shabby" room. Vong Paseud Guesthouse: From 5 USD. Don Daeng is a tranquil island in the Mekong River with sandy beaches, where the traditional Lao rural life with rice farming, coconut and sugarcabe plantation, fishing and basket weaving is going on. A path leads around the island - suitable for bicycling. You find some small stores, where you get a noodle soop Read reports by my egg noodles and twntysmthg.sg. In the village Ban Hua Don Daeng you can stay overnight in a community lodge or with local families (mat, pillow and blanket on the floor). Conract the District Tourism office in Champasak or the Provincial Tourism Office in Pakse (phone +0856 031 212 021). 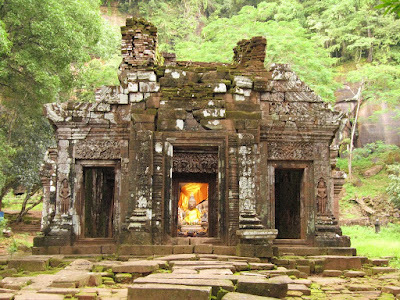 Vat Tomo (also called Ou Moung or Huei Thamo): On a boat trip you discover these temple ruins, set in a forest, about 11 km southeast of Vat Phou, on the east side of the Mekong near Ban Tomo. 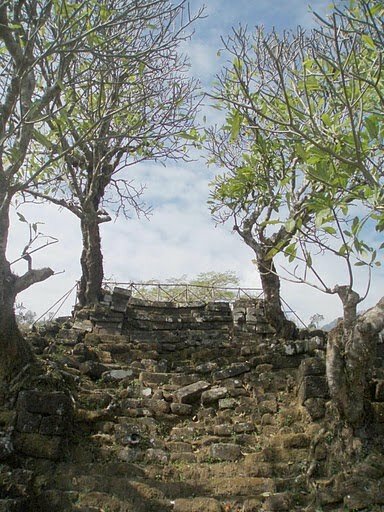 Vat Tomo consists of a laterite enclosure wall, two gateways in good condition and the original temple, which has collapsed. The ruins of the shrine's brick towers lie in the center of the enclosure. The temple dates from the 7th or 8th centuriy and and has been reconstructed in the 11th/12th century, during the Angkorian period. 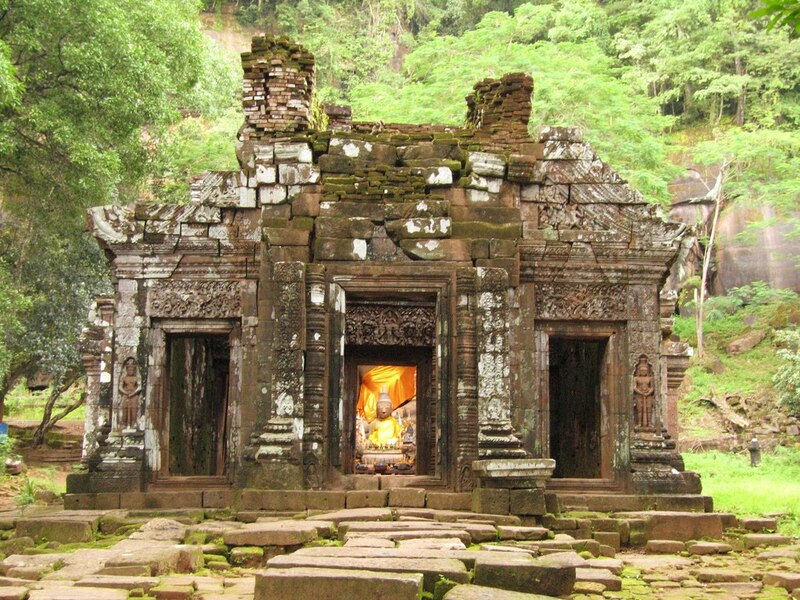 It seems it has been built first as the female counterpart to the Shiva Temple at Vat Phou, according to an inscription it was in 889 dedicated to Rudrani, the shakti of Shiva. "It houses a rare mukhalinga, a stone linga with two clearly-defined albeit gloomy faces", notes Andy Brouwer, who has good pictures. 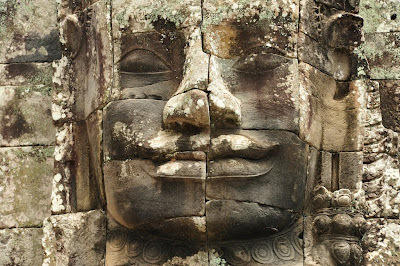 "It is the only one in Southeast Asia with four faces of Shiva looking in the four cardinal directions", writes Willard G. Van De Bogart. Read also the description by travelfish.org. More pictures on kuradashieigakan.com. 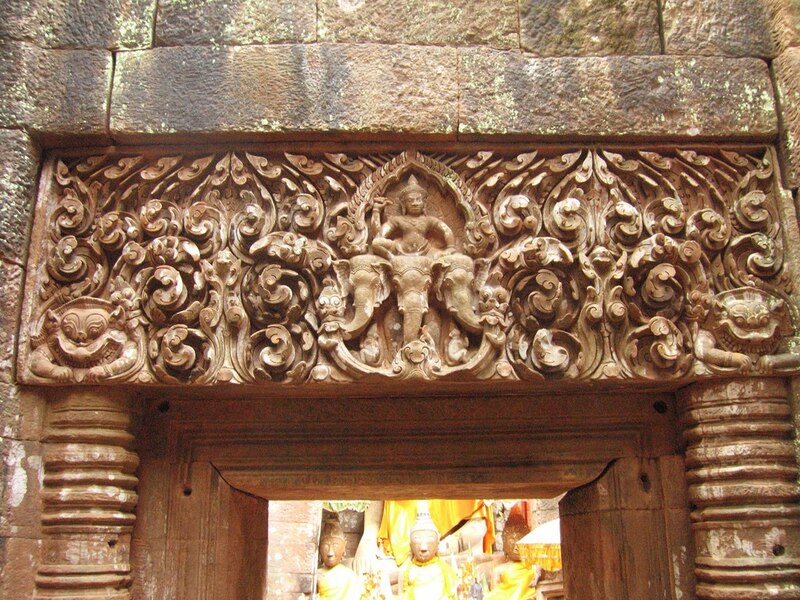 Read more on Vat Phou Fund for the Safeguarding of Champasak Heritage.